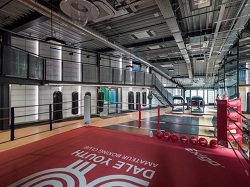 MANCHESTER, N.H. – New Hampshire-based Kalwall, its UK distributor Structura and German curtain wall innovator RAICO pitched in to help a revered London boxing club rebuild after the devastating Grenfell Tower fire destroyed its home. The community effort to provide the Dale Youth Amateur Boxing Club of London with a new facility was featured on the BBC hit show DIY SOS, documenting the project after the club’s previous home was lost in a deadly fire that caused 72 deaths and destroyed the Grenfell Tower in June of 2017. The club has been providing a safe harbor for young people in the community and training top boxers for almost 50 years. After the fire, the club was training out of an abandoned parking garage. The new facility, built on a nearby site, took 63 days to complete and is part of a larger development project. 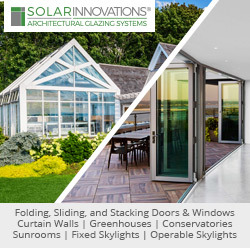 Kalwall, Structura and RAICO teamed up to provide the curtain wall system that envelops the builiding. The façade is comprised of 200 square meters (656 square feet) of Kalwall translucent sandwich panels. The panels are incorporated into RAICO’s innovative THERM+ stick built curtain wall and was the first project in the global partnership between Kalwall and RAICO.